The XTT Cell Viability Assay Kit provides a simple method for determining live cell numbers using standard photometric microplate readers. Determination of live cell numbers is often used to assess the rate of cell proliferation and to screen cytotoxic agents. XTT is a tetrazolium derivative. Similar to MTT, XTT measures cell viability based on the activity of mitochondrial enzymes in live cells that reduce XTT and are inactivated shortly after cell death. 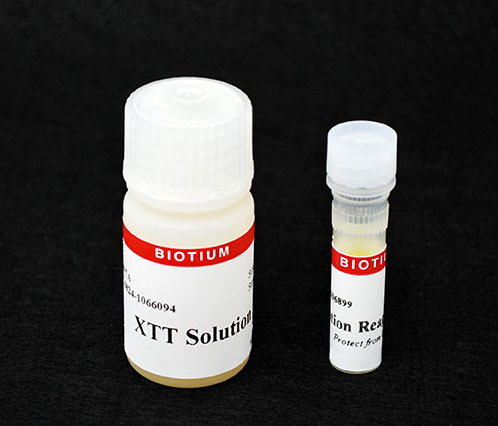 Unlike MTT, XTT is reduced to a highly water-soluble orange-colored product instead of the insoluble formazan from MTT, thus eliminating the solubilization step required for the MTT assay. The amount of water-soluble product generated from XTT reduction is proportional to the number of living cells in the sample and can be photometrically quantified at 475 nm. Continuous color development permits measurements at multiple time points for extended detection range. 1. J Infect Dis 172, 1153 (1995). 2. J Immunol Methods 159, 81 (1993). 3. J Immunol Methods 147, 153 (1992). 4. J Immunol Methods 142, 257 (1991). 5. J Natl Cancer Inst 81, 577 (1989). 6. Cancer Res 48, 4827 (1988).